To get your Ford Radio CodeThere is no need for you to visit a Ford Dealership with the V5 and your ID and pay on average £15 to £50 for the radio code or to have the Sat Nav system sent away! You can unlock the radio in your Ford car, van, people carrier, minibus or chassis cab from the serial number of the Cassette, CD Player or Sat Nav instantly online 24/7 seven days a week or by telephone from 9 am to 6 pm. 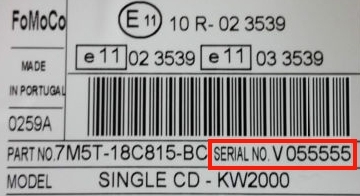 Step 1: Find The Serial Number. Step 2: Remove Your Radio From The Dashboard. 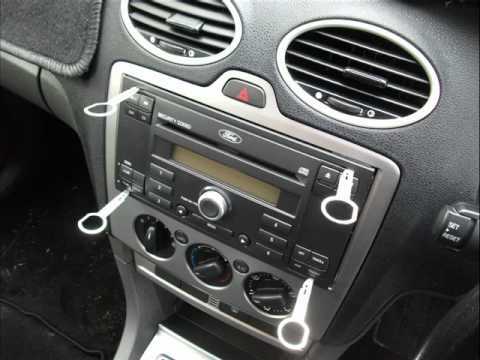 Removing the radio is easily done using a set of Ford Radio Removal Keys these can be purchased from a local car audio accessories shop or a Halfords store. Step 3: Enter The Serial Number Into The Search Form. Once you have the serial number from the label enter this into the code search form, if your code is available you can either press the 'Buy Now' button to get your code online using your PayPal account or your Credit or Debit card or you can telephone 020 8243 8962 from 9 am to 6 pm and pay by Debit or Credit card.